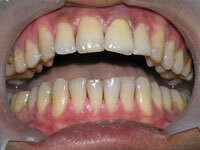 Crown Bridge :: Precious Smile Dental Cosmetic Centre :: Surat :: Gujarat :: India. A crown is a strong cover that entirely lies over the top of a tooth, restoring broken down tooth to its ideal anatomical shape and colour, while protecting the remaining tooth structure underneath. 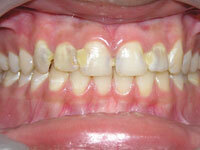 Crowns are indicated to strengthen broken down teeth and prevent teeth from breaking. 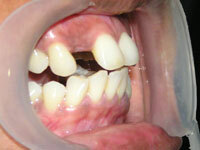 A bridge replaces a missing tooth or teeth. 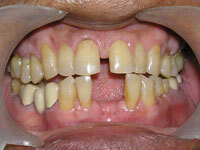 A bridge is a structure, supported by teeth on either side of a space. 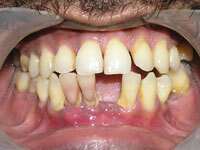 It spans the gap between teeth, just as a bridge spans a river. Types of cwown and bridge. In this type basic frame work of bridge is made up of metal and porcelain or ceramic is fused over it. Depending on core metal used for crown and bridge, they are of different types. A. Non precious metal ceramic. D. captek crown and bridge. 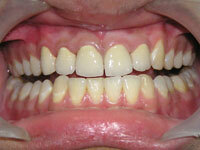 In this type, core structure is made-up of special ceramic called Alumina or Zirconia , instead of a metal. With recent advances in the way crowns are constructed at Smile Artistry we are choosing to use Zirconia-Porcelain Crowns because of their superior cosmetic appearance than traditional Porcelain-Fused-To-Metal Crowns. 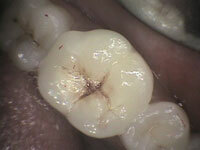 The milling of the inside of a Zirconia Crown is performed by a CAD-CAM Computer system in World Class Laboratory. This provides our Technicians with high strength inside of the crown whilst maintaining extremely high aesthetic properties and an optimal fit, even better than traditional Porcelain-Fused-To-Metal Crowns. 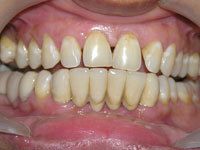 Zirconia is a white material, where metal is a grey material, thus zirconia is an ideal tooth colour substitute. This distinct cosmetic benefit also arises because light can transmit through the coping in a way that perfectly mimics a natural tooth. 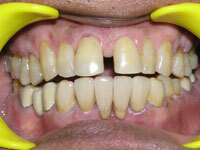 A layered Porcelain is layered over the computer milled coping, in a way that personalizes the colour and texture to match adjacent teeth. Zirconia and Porcelain technology means that Smile Artistry can provide a unique combination of both strength and beauty. 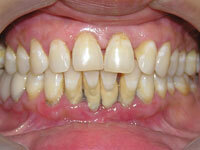 • You may have had a root canal treatment which will require a crown to protect it. • You may have had an accident and damaged the tooth. 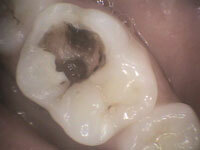 The tooth is prepared to the ideal shape for the crown. 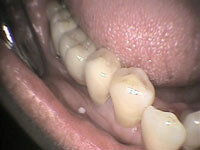 This will involve removing most of the outer surface, and leaving a strong inner 'core'. 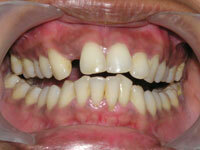 The amount of the tooth removed will be the same as the thickness of the crown to be fitted. Once the tooth is shaped, an impression is taken of the prepared tooth, one of the opposite jaw and possibly another to mark the way you bite together. 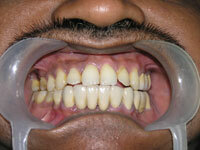 The impressions will be given to the technician, along with any other information needed to make the crown. No. The crown will be made to match your other teeth exactly. The shade of the neighbouring teeth will be recorded, to make sure that the colour looks natural and matches the surrounding teeth. This is done using both a shade guide and digital photography. 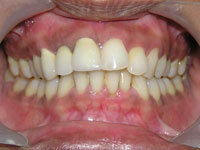 The technician will be able to match the characteristics of your own teeth with the help of the digital image. A temporary crown, usually made in acrylic, will be fitted at the end of the first appointment to last until the definitive one is ready. At least two visits are needed, the first for the preparation, impression, shade taking and fitting the temporary crown, and the second to fit the permanent crown. The first appointment would normally be an hour. The life of a crown will depend on how well it is looked after. 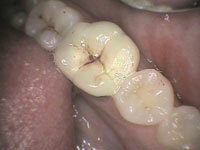 The crown itself cannot decay, but decay can start where the edge of the crown joins the tooth. 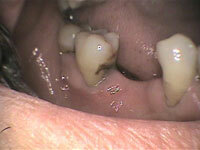 It is very important to keep this area as clean as your other teeth, or decay may occur which could endanger the crown. Properly cared for crowns will last for many years. Because the shape of the crown will be slightly different from the shape of the tooth before it was crowned, you may be somewhat aware of it to begin with. Within a few days it should feel fine, and you will become unaware of it. 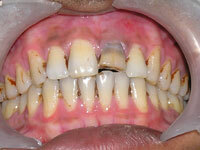 The crown may need some adjustment if it feels proud of the surrounding teeth. If it is at all uncomfortable you should return so it can be checked and adjusted. .
Do I need to clean any differently around my crown?